Select the design element that you want to have stand out. Then low-key most of the other elements so that the end result is pleasing. 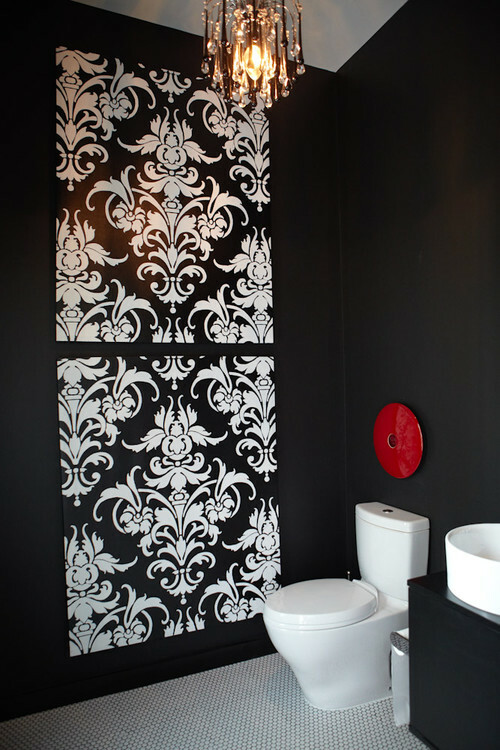 So, if you are using a killer tile, scale back on the other accents, and don’t go with a too-busy-anything-else. 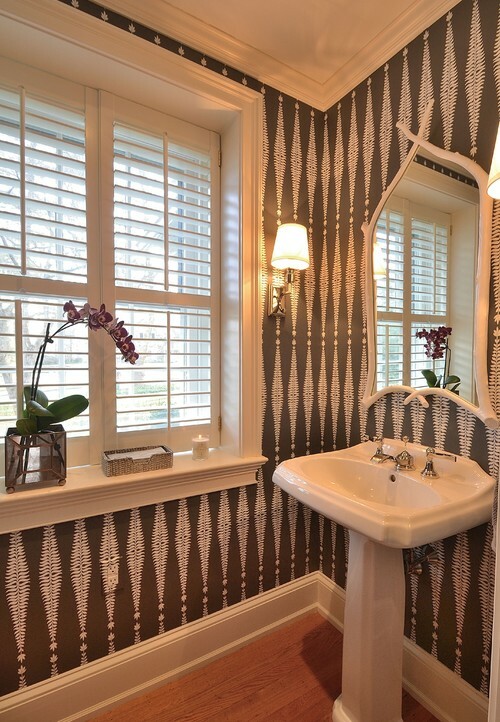 If you have a mirror that is extremely decorative, don’t kill it with everything else being extremely decorative. 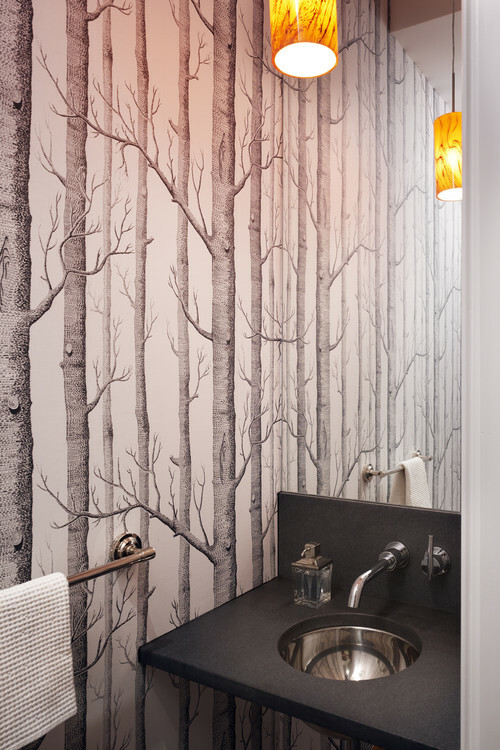 If you like wallpaper, this is the place for that wonderful statement wallpaper. 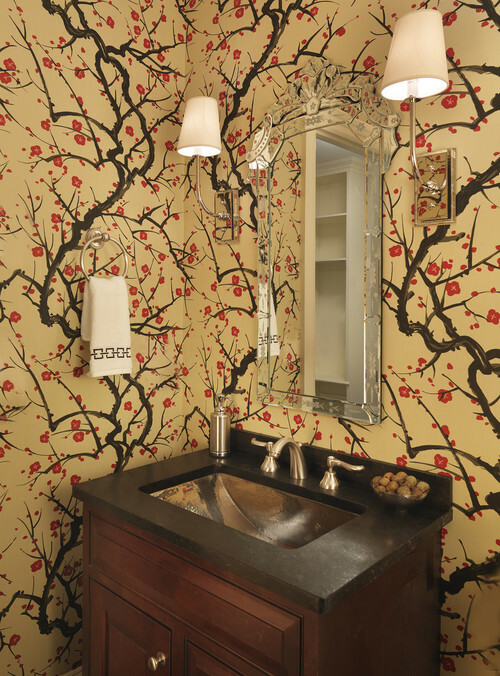 High-end designer wallpaper that would be too-too much in a regular sized room can be perfect in a powder room. Decide what is going to become your most important design element, so you don’t get carried away with too many other decorative finishes. 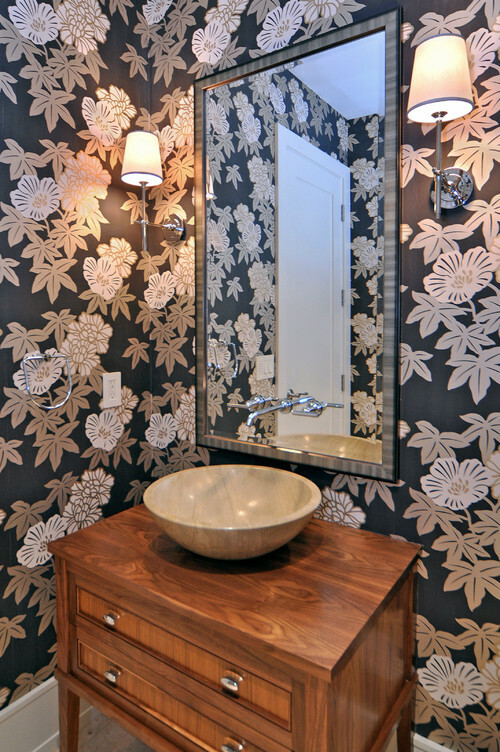 A good residential stylist can keep you on track if you are prone to going over the top. 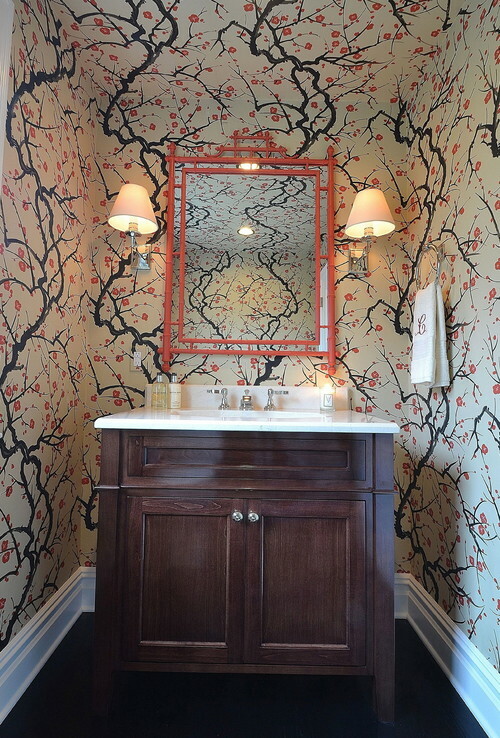 ABOVE, both photos: This gorgeous chinoiserie wallpaper is the most dramatic element in each of the above powder rooms, with proper restraint used everywhere else. 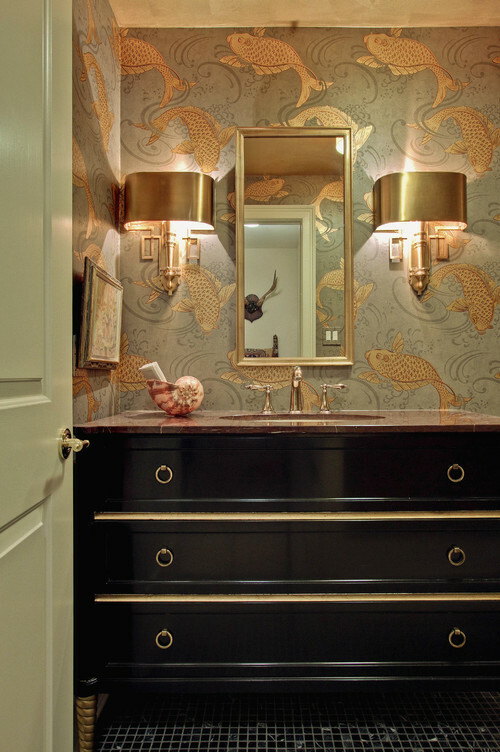 Don’t mix your metals/finishes in a Powder Room. 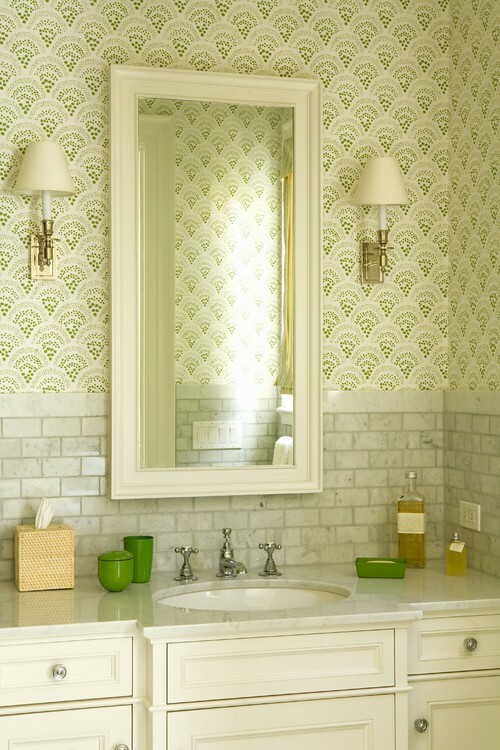 Try to keep the same finishes in the tiny space for a more harmonious look, below. ABOVE: The color white is repeated several times. The nickel hardware is repeated several times. 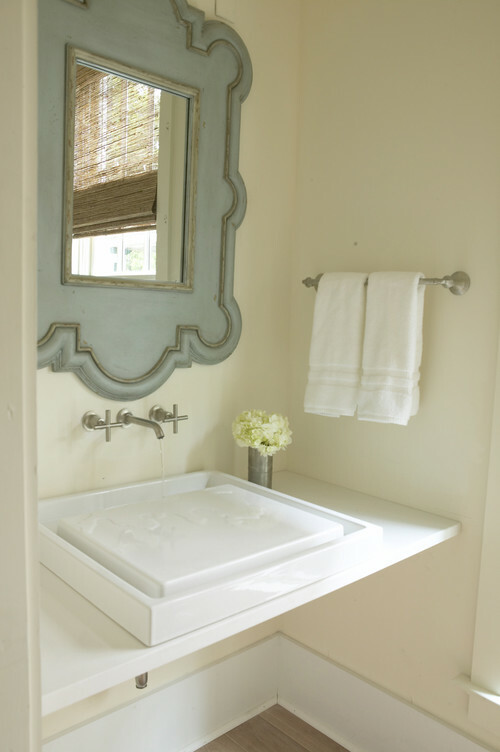 The airy mirror almost goes away and lets other elements take center stage. 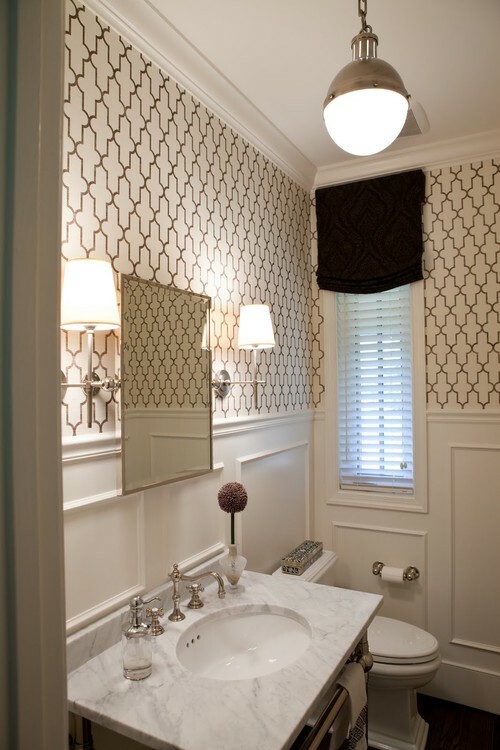 BELOW: The Pewter color is repeated even in the wallpaper, and the all-pewter gives the powder room a harmonious look. 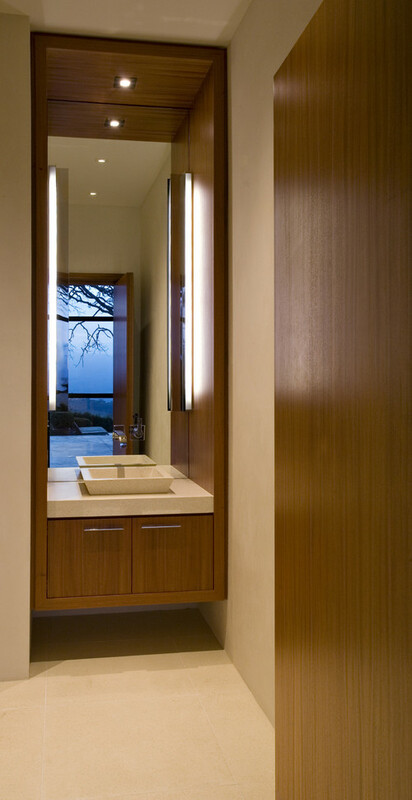 ABOVE: Even a very tall person can see his reflection in this nicely-sized mirror. 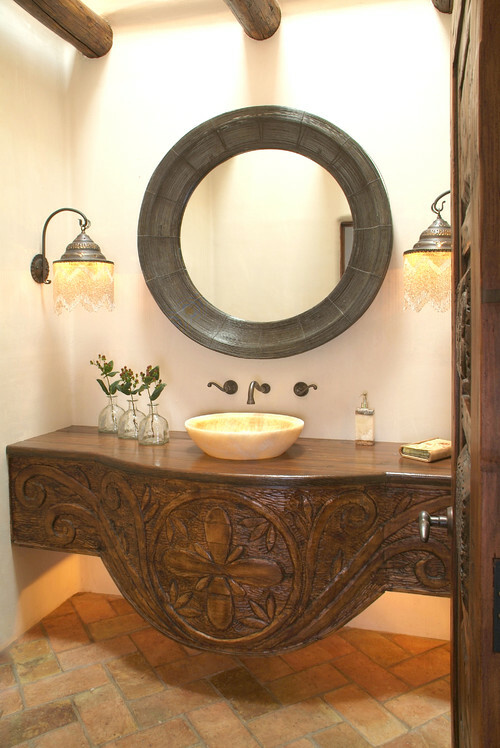 Use sconces in addition to overhead lighting. 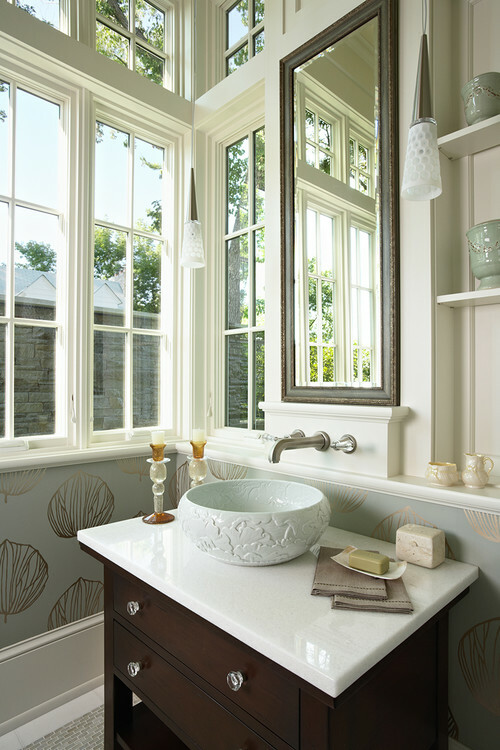 Over-mirror lighting can throw odd shadows and is to be avoided. splashing. However, I try to avoid them altogether. 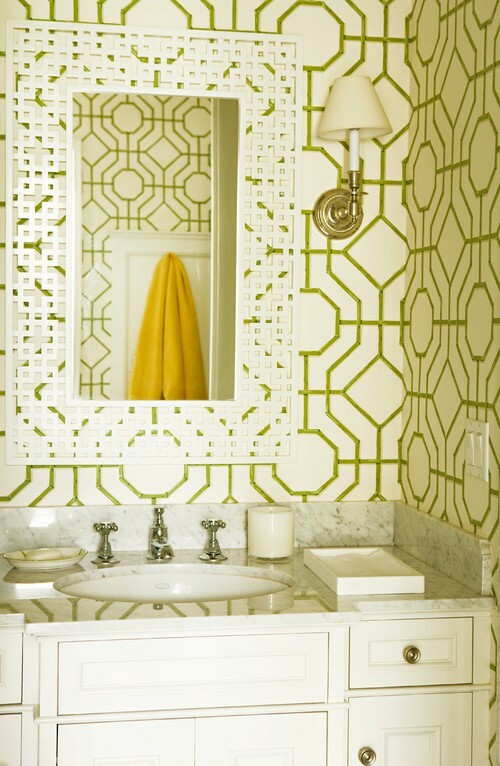 accents pick up the main color of the wallpaper. Just enough drama without going over the top. 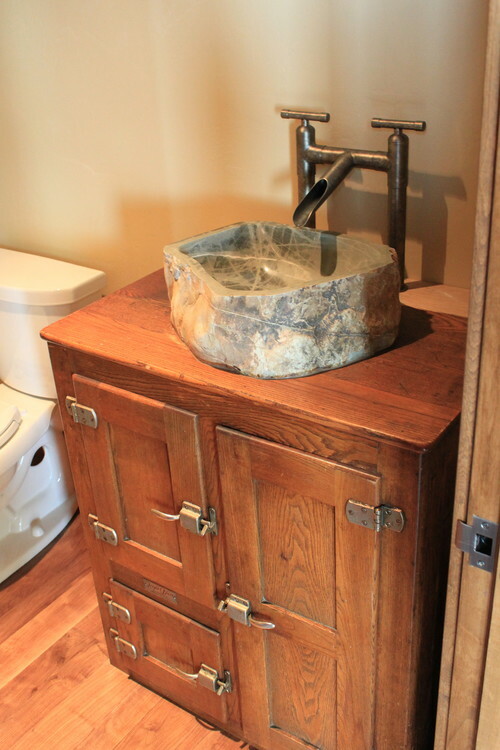 Use antique, repurposed, or vintage pieces if doing a furniture-look built-in. 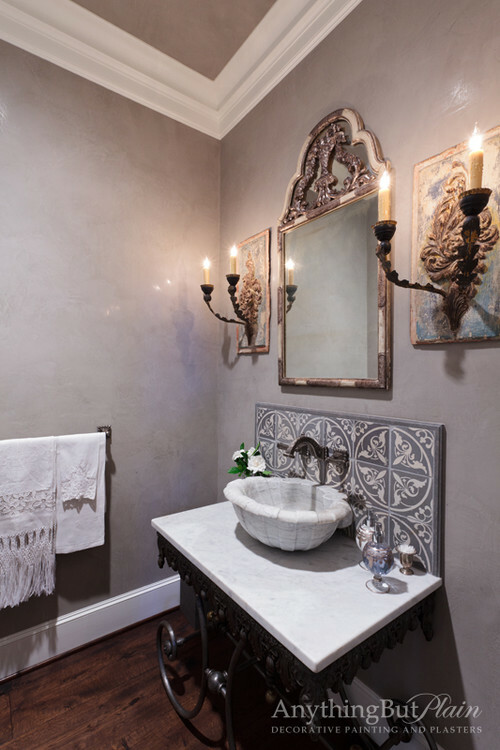 Mediterranean Powder Room design by Houston Paint And Wall Coverings Anything But Plain, Inc. Otherwise, use nice built-in cabinetry. A brand-new piece of furniture for your sink almost never works . Use creamy whites with brown, and whiter whites with black. Quality over quantity. 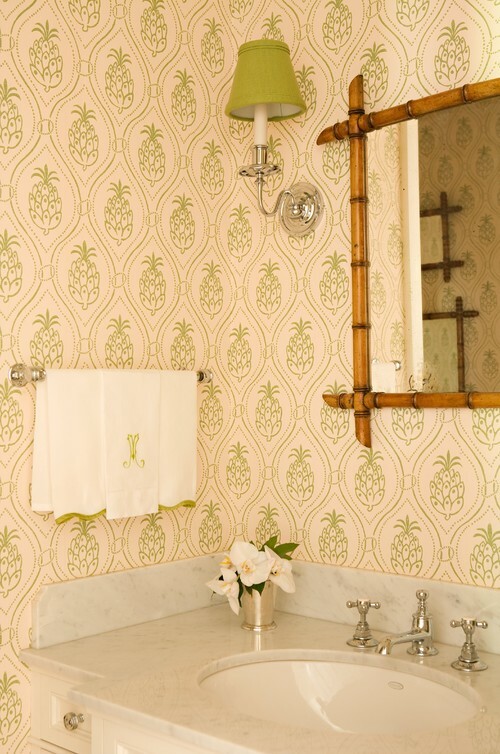 Don’t over-accessorize, and do use the nicest soaps and linens you can possibly afford. 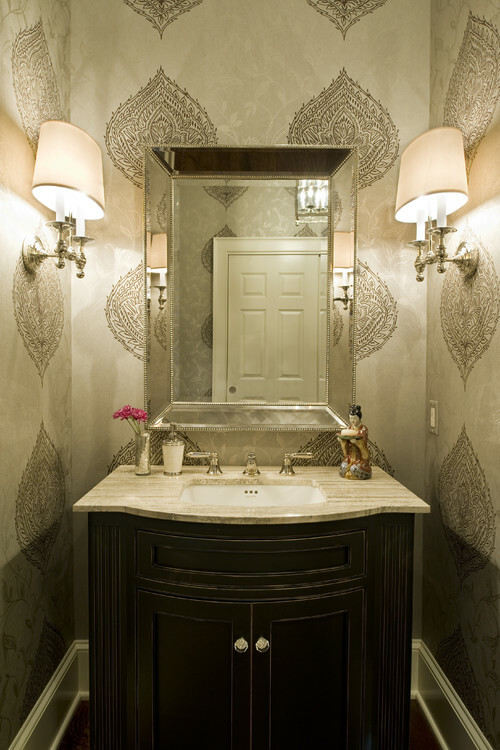 Eclectic Powder Room design by San Diego Kitchen And Bath Hamilton-Gray Design, Inc.
What do you think? 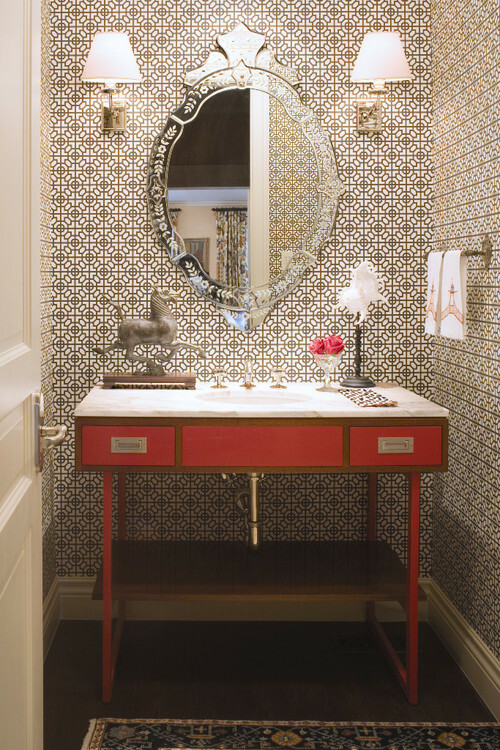 Do you agree with my Ten Rules for Beautiful Powder Rooms? This entry was posted on August 7, 2012 by Ellen at Color Calling. 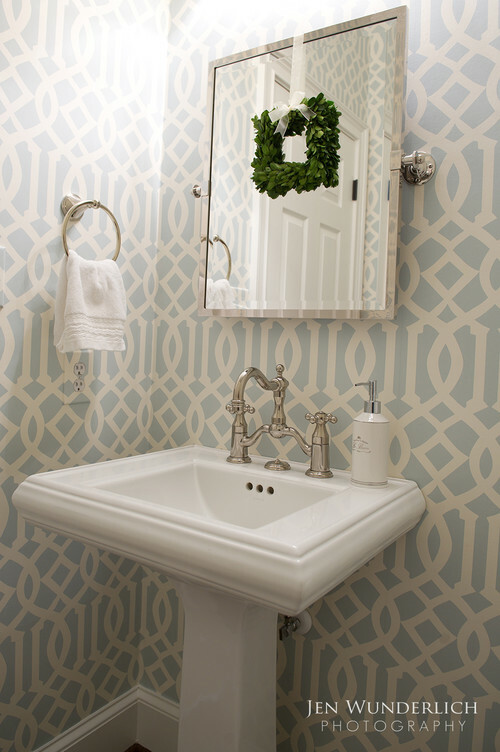 It was filed under Benjamin Moore colors, Chinoiserie, Mirrors, Residential styling, using the color white and was tagged with decorating, focal points, powder room.